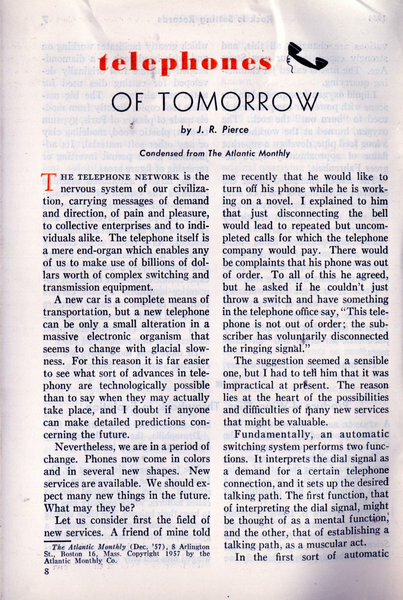 by J. R. Pierce Condensed from The Atlantic Monthly The telephone network is the nervous system of our civilization, carrying messages of demand and direction, of pain and pleasure, to collective enterprises and to individuals alike. 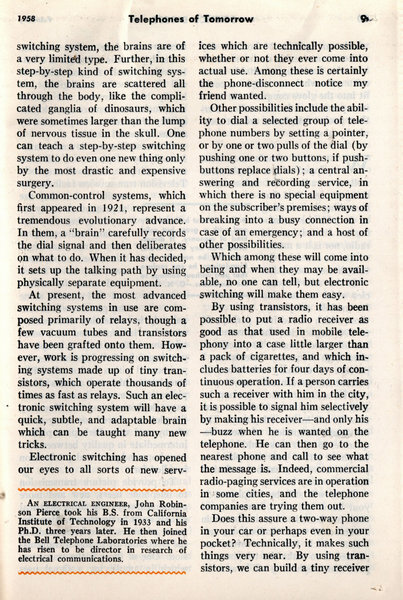 The telephone itself is a mere end-organ which enables any of us to make use of billions of dollars worth of complex switching and transmission equipment. A new car is a complete means of transportation, but a new telephone can be only a small alteration in a massive electronic organism that seems to change with glacial slowness. For this reason it is far easier to see what sort of advances in telephony are technologically possible than to say when they may actually take place, and I doubt if anyone can make detailed predictions concerning the future. 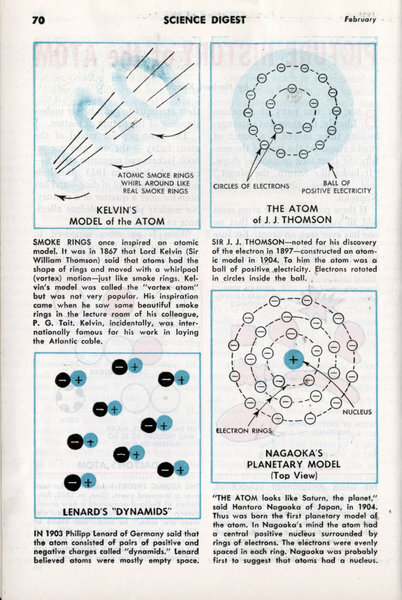 by Herbert Kondo Back in the days of Abraham Lincoln, the atom was a strange-looking thing indeed — a bunch of smoke rings. At the turn of the century the atom took on another shape. "It looks like Saturn, the planet," said Japanese physicist Hantaro Nagaoka. 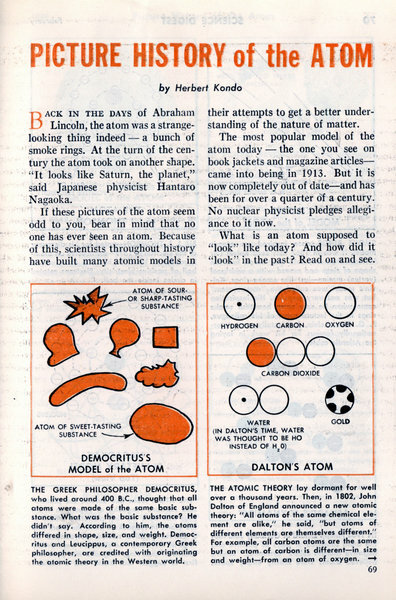 If these pictures of the atom seem odd to you, bear in mind that no one has ever seen an atom. Because of this, scientists throughout history have built many atomic models in their attempts to get a better understanding of the nature of matter. 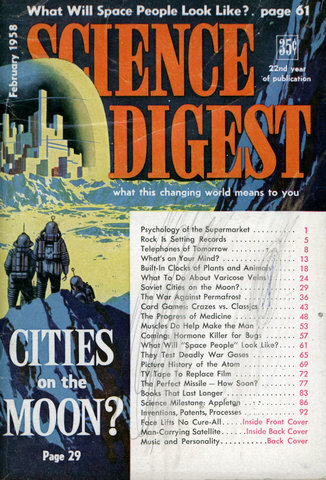 Soviet Cities on the Moon? by Albert Parry We advertise our failures, but the Soviets don't. For all we know, Moscow's scientists and engineers did try to shoot a rocket to the moon last November 7, to celebrate the 40th anniversary of the Communist seizure of power in Russia, but failed. You will recall that for a while, during that weekend, some mysterious radio signals were heard from outer space. They were not accountable by the two Sputniks, and soon they faded out. 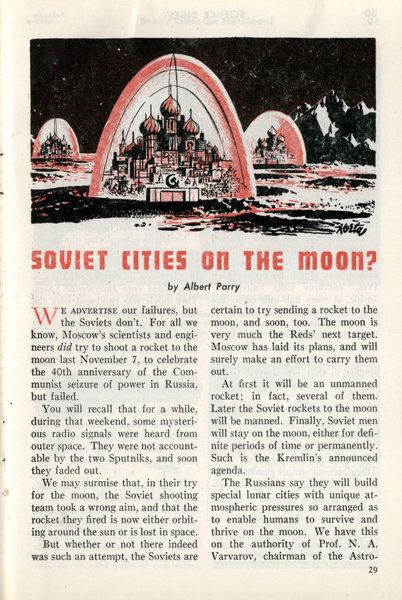 We may surmise that, in their try for the moon, the Soviet shooting team took a wrong aim, and that the rocket they fired is now either orbiting around the sun or is lost in space. 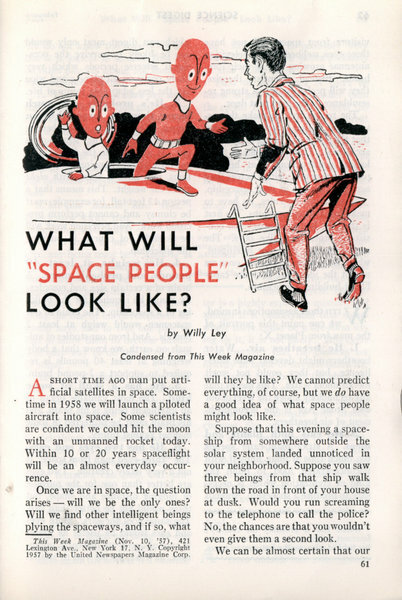 WHAT WILL "SPACE PEOPLE" LOOK LIKE?